China is conducting a census on the number and living conditions of its military veterans as the country strives to arrange for their settlement and improve their life. In 2018, China's Ministry of Veterans Affairs (MVA) has arranged the settlement of more than 80,000 demobilized officers and more than 400,000 demobilized soldiers, said Wang Zhiming, spokesperson of the MVA, at a press conference on Wednesday. Some 123 central enterprises were, for the first time, listed as veteran settlement companies, which provided more than 15,000 jobs in 2018, Wang said. Wang did not specify on the details of the settlement but the MVA said 2018 posed the greatest challenge in veteran settlement during China's military reform. Nearly 50,000 demobilized officers and 40,000 demobilized soldiers qualified for a job arrangement, said Bao Fengyu, head of the MVA's transfer and arrangement work. 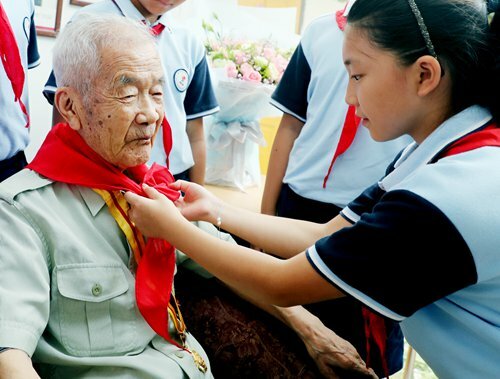 China has had 57 million veterans since the country's founding in 1949, but some of them have passed away, and an accurate number is expected to be given in May, said MCA. The country is calling on veterans to register their status at local military offices to help build a more accurate database for future assistance. Information they need to provide includes current employment condition, housing situation, social insurance situation and possible difficulties the veteran is facing, the Global Times has learned. The MVA on Wednesday also said it attaches great importance to the work of accepting petitions, and every veteran will be warmly received, said Ma Feixiong, head of the ministry's ideological, political and rights-defense work. When veterans understand the policies, there will be no need for them to lodge petitions, Ma said, noting that if petitions are made, the ministry will actively and responsibly take care of them. One of the biggest reasons for veteran petitions in the past was policies were often not properly implemented at grassroots level. A former People's Liberation Army (PLA) officer surnamed Wang told the Global Times on Wednesday that some veterans' appeals in the past did not get a response or stayed unsolved. A decommissioned soldier surnamed Dai told the Global Times on Wednesday that while the policies are often good, local authorities could not implement them due to insufficient funds or supervision.